Check out our other tour company, Baltimore Ghost Tours! 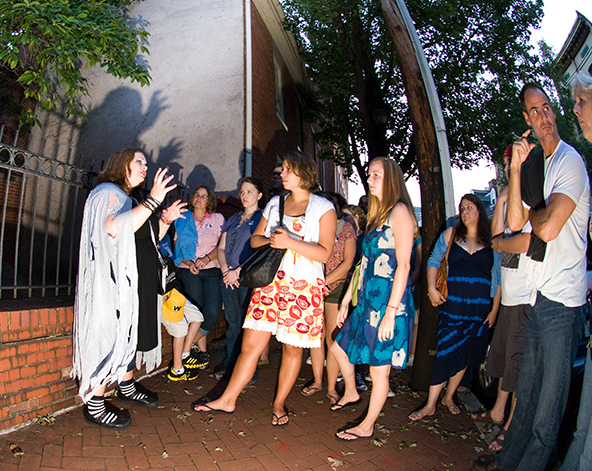 Since 2001, locally owned and operated Baltimore Ghost Tours has regaled thousands of locals and visitors alike with spellbinding tales of Baltimore Maryland’s haunted history on our walking tours! Picture Fell’s Point, in Baltimore, Maryland, as it was, a rowdy seaport town, the birthplace of the sleek and dangerous clipper ship. Its streets were full of sailors from foreign lands spilling off ships, immigrants anxious to start a new life, and ladies of the night looking to make ends meet. Given this explosive combination, is it any wonder that many ghosts remained behind? Join Baltimore Ghost Tours on a walking tour or haunted pub crawl to explore the many haunted taverns, shops, and residences of Fells Point. But don’t stray too far from the group because you never know when you’ll find yourself face to face with the unknown. Group tours available!